Except for most shellfish, calamari and escargot (I’m working on it), there’s not a ton I won’t eat. And even less I won’t try once. But cole slaw has always been a nemesis of mine. 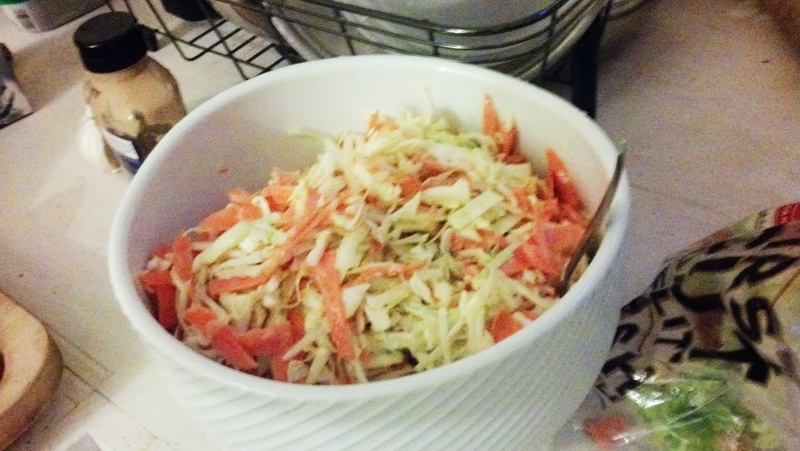 The first slaw that turned me was my aunt’s. She’s a marvelous cook and she was the first to open my eyes to the world of non-gooey cole slaw. Since then, I”ve been tasting different slaws left and right, so I was pumped when our friends visiting from France decided to make their own version for dinner one night. It’s the perfect, light summer fare–and super easy, too! Look how fast he’s chopping that cabbage! Allez, Michel! Mix the egg yolk, mustard, apple cider vinegar, salt & pepper. Then, as you whisk, slowly add the oil until it reaches a creamy consistency. Add the crushed ginger & garlic & mix again until just blended. In a large bowl, mix the cabbage, onion and carrot. Add the dressing, and mix well. Yum! Not overdressed, nice and cool for a hot day!